The biggest thing in microsurgery is standard operating procedure at the hospitals of Methodist Health System. Unlike traditional laparoscopic gallbladder removal, this sophisticated robotic technology enables our surgeons to use a single, tiny incision through the navel — resulting in a virtually painless and scarless experience. It’s also reassuring to know that most patients return home into the arms of their loved ones the same day. Talk about comforting. Are you facing gallbladder surgery? Independently practicing physicians at Methodist Health System are among the first in North Texas to perform Single-SiteTM da Vinci robotic surgery to remove a gallbladder from a patient (cholecystectomy), using the revolutionary FDA-approved Single-Site da Vinci robotic platform. The Single-Site system enables surgeons to reduce the traditional number of incisions from four, down to one incision through the belly button that is less than an inch in length. This procedure is performed through a single incision using state-of-the-art precision instruments. Gallbladder surgery patients who choose Single-Site da Vinci Surgery experience a virtually scarless procedure since surgery is performed through only one incision in the navel (belly button), which dramatically limits visible scarring. The da Vinci Surgical System is designed to overcome the limitations of manual laparoscopy with enhanced capabilities, including high-definition 3D vision and a magnified view. Though it is often called a "robot," da Vinci cannot act on its own – the surgery is performed entirely by your doctor. Together, the da Vinci System and Single-Site instruments allow your doctor to perform gallbladder surgery through a single incision. As a result, you may be able to get back to your life without the recovery or scars that usually follow major surgery. If you are a candidate for gallbladder surgery, call to find a physician performing da Vinci Single-Site Robotic Gallbladder Surgery. 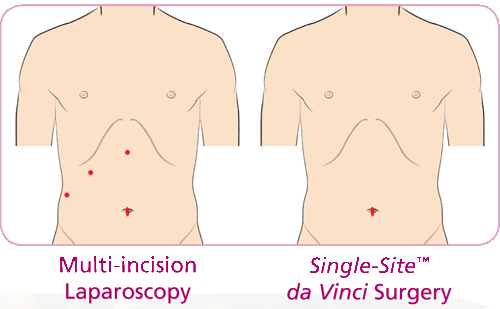 *While clinical studies suggest that the da Vinci® Surgical System using Single-SiteTM Instrumentation is an effective tool for single-incision cholecystectomy, individual results may vary. Surgery with the da Vinci Surgical System may not be appropriate for every individual. Always ask your doctor about all treatment options, as well as their risks and benefits.